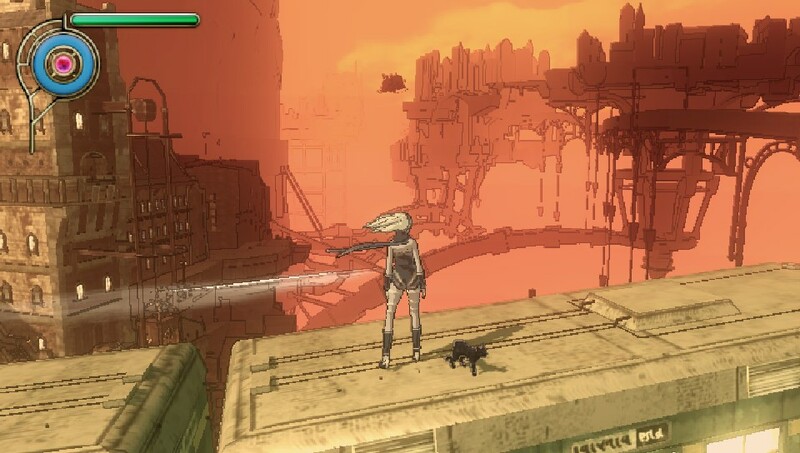 After playing through Call Of Duty: The One For the Vita and Assassin’s Creed: The One For the Vita, I thought that it might not be a bad idea to actually try a game designed specifically for the system. Fortunately, I subscribed to Playstation Plus recently and wound up with several to choose from. 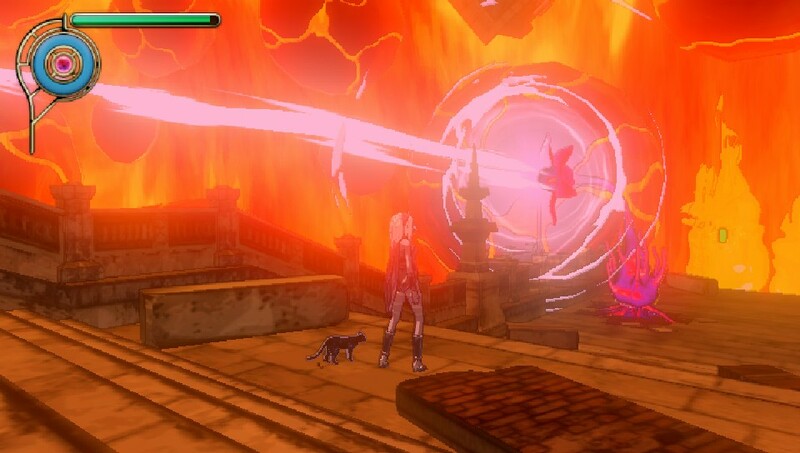 Only one of them featured the exploits of a cute girl and her gravity-altering cat, so Gravity Rush it was. The girl is also named Kat, by the way. 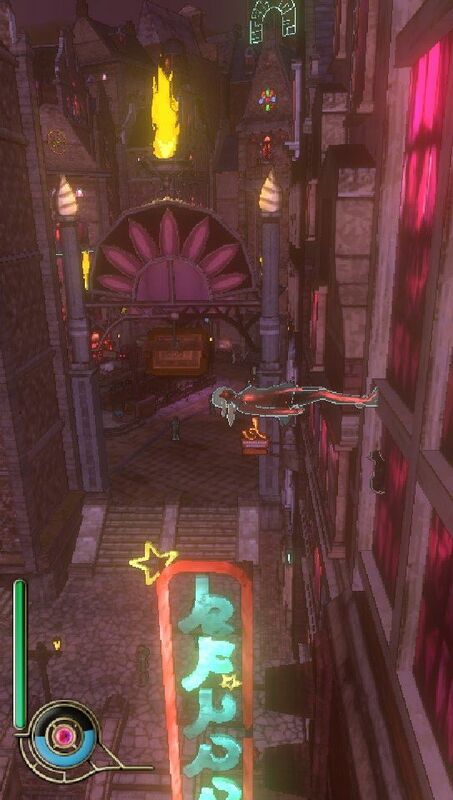 The world of Gravity Rush is a collection of psuedo-European towns on floating sky islands, connected by trains and aircars. For some reason, bits of these flying islands have been breaking off and disappearing, and the plot, after a couple of introductory tutorial-style missions, revolves around you (a) restoring these missing islands from surreal alternate dimensions and (b) foiling the plans of a master thief. Well, that’s the first half anyway. After that, you discover that an offhand comment from an NPC in one of the very early levels is actually tied to the real plot, which is a bit darker and more serious. It is, I suppose, spiritually a platformer. You traverse a variety of fantastic environments, picking up gems to spend on powering up your abilities, you occasionally fight a boss, and there’s a lot of jumping (falling) on heads. There’s just not much platforming. 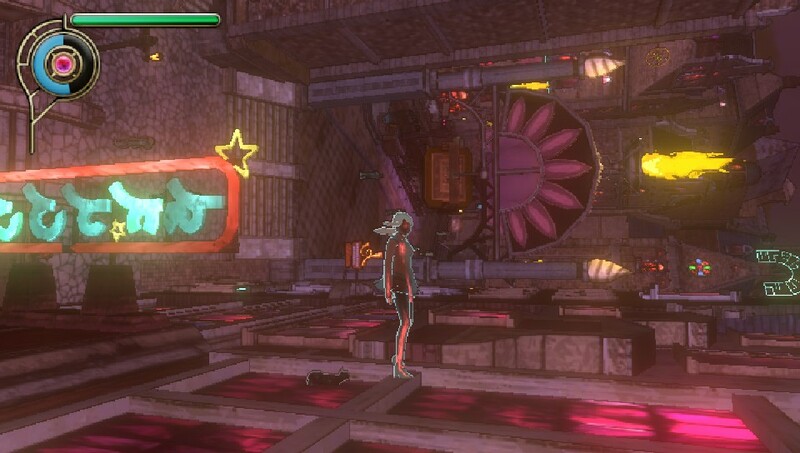 The core gimmick of the game, as the title suggests, is gravity manipulation. Put simply, you get to decide, at any moment, which direction you consider “down”, at which point you fall in that direction until you hit something or press the button which cancels gravity completely. 2) The same screenshot, now rotated so that “up” is actually at the top of the image. With the ability to make “down” be whatever it is you like, you get a freedom of movement that is unlike anything I’ve played before. It does take a while to adjust to the notion that you’re not actually flying so much as falling with style, at least in my case, but I pretty much had a permanent grin on my face once I got the hang of it. There’s a button to press that more-or-less reorients the camera to suit conventional ideas of up and down if you ever get totally lost. Adjusting to combat took a little more work – there’s a lot of lining gravity up JUST SO in order to send Kat flying in the general direction of a brightly-illuminated weak spot on a boss, and I will confess that a couple of the boss fights had me clenching my teeth as I charged just in time for the boss to move out of my way. Also, the final fight is on a timer which made for extra unfun times. That said, it was a solid ten hours of fun marred only by about half an hour of annoying boss fights. It also has a fantastic soundtrack, and fortunately someone else has already gone to the trouble of finding youtube clips so you can listen to it. Finally, a couple more screenshots with less confusion about which way “up” really is. Above: Kat takes the train between two towns. Sadly, no pets are allowed so she has to ride on the roof. And here’s a visual of the sort of stuff you see in the alternate dimensions. This game is about as far as you can get from a brown and gray color palette.